Brian Evans, now retired after a career in printing and publishing, has enjoyed a lifetime's love of the outdoors. He has climbed, walked, skied and camped in many parts of Europe and North America, yet always returns to the Lake District, which has a special place in his affections. He prefers to explore out-of-the-way places, preferably with the added attraction of rock, to which he has been addicted since childhood. 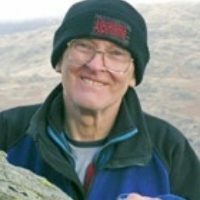 Brian has always enjoyed adventure sports including pot-holing, wild-water canoeing, skiing and alpine mountaineering. He still particularly enjoys rock climbing in all its forms, from long adventurous climbs where route-finding skills are necessary to single-pitch bolted sports climbs in the Mediterranean sun. In recent years Brian has enjoyed multi-day mountain bike trips in Portugal, Spain, France and Morocco, as well as biking in many wild and beautiful parts of Britain. Some of Brian's most memorable trips include multi-day alpine climbs such as the West face routes of the Dru and the Aiguille Noire; walking across the remote interior of Iceland; ski-backpacking in France; canoeing tumultous alpine rivers; and delving deep underground in the Vercors potholes. At home in Lancashire with his wife, Aileen, and collie, Jess, he enjoys drawing and painting, and planning the next adventurous trip.